These lovely little things are over on Annettes blog Sunshine Yellow. They’re really quite simple and all you need is some ribbon a few beads and a needle and thread. You can make them in whatever colours you like. I’m not going to link to a tutorial for these (I did attempt to find the original blog but couldn’t) as I think they are pretty straight forward but I wanted to share the idea with you all. There are loads more ideas for felt ornaments on Pinterest. 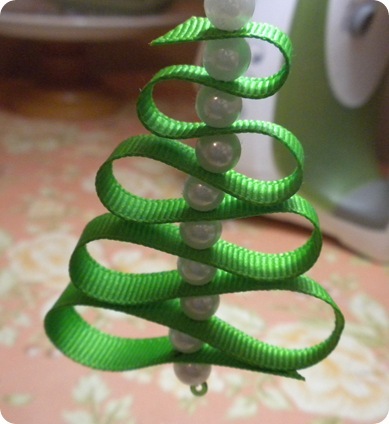 I have a few of my favourite, very simple ones on my Christmas Craft board. But these ones are definitely my favourite ones. Okay so these aren’t exactly simple, quick crafts unless you are into beading. But they are so pretty that I’m including them anyway. A picture tutorial for these is over here. But it is just a picture tutorial unfortuantely. I couldn’t find the original tutorial but if you do, let me know and I’ll add it. on wikihow and it takes you through the steps with great photos along the way to help. All you need is six pieces of paper (or less if you want to cut them smaller), scissors, a stapler and some glue or tape. < Previous Tunisian Crochet Blanket – TA DA!